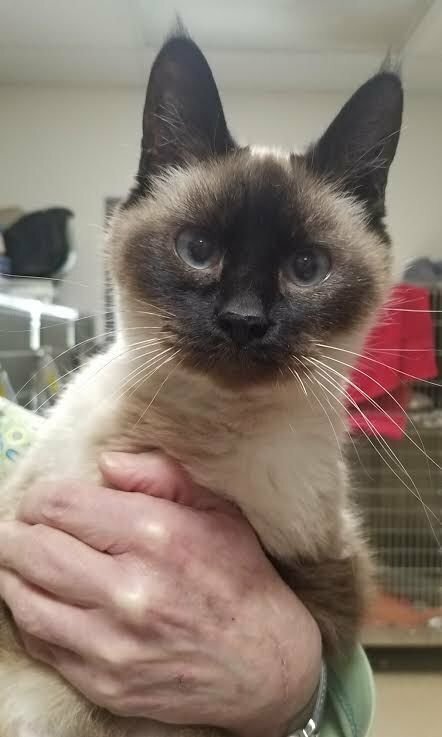 Ling is a 6-year-old Siamese girl who came into the shelter as a stray, believe it or not. She is super nice with a very expressive face. We had her go for a dental to help with her teeth and she seems to be doing really well. Could Ling be the girl for you? Herbie, the lovebug, is a dog, not a car. 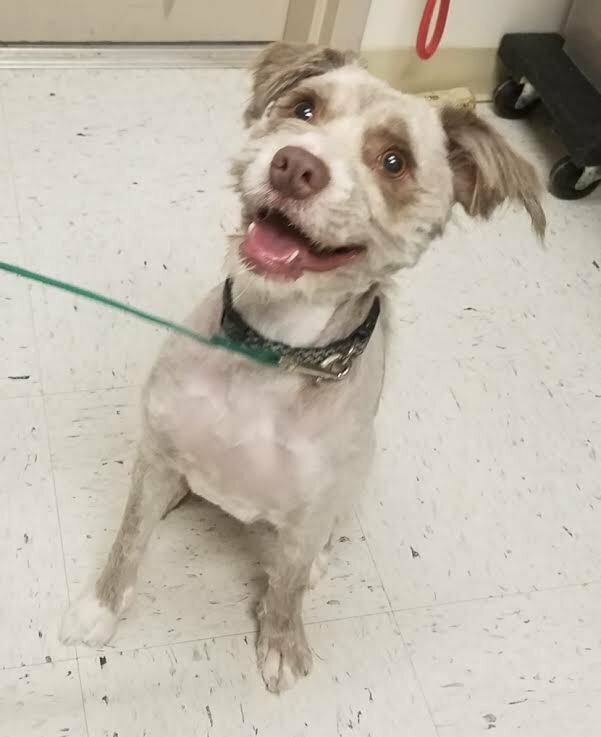 He’s a 2-year-old bearded collie mix who came into the shelter as a stray. Herbie is one fun-loving guy. Just look at that face! He’s going to make someone a wonderful companion. I have a superstar that I must tell you about. No, I didn’t meet anyone famous over the weekend, although I do have a rather lengthy list of TV boyfriends who if I ever actually met would likely make me plotz. The superstar I’m referencing is a guy named Boden. Boden is a 1-year-old beagle/lab mix who was adopted out, but returned to us because he developed hypothyroidism. The thyroid is a gland found in the neck of both humans and animals that produces a hormone that controls metabolism. It helps turn food into fuel. When an animal or person has hypothyroidism, the thyroid gland doesn’t work like it’s supposed to and doesn’t make enough of that hormone. In dogs, it can affect everything from coat to weight to energy level to ear and toenail infections. The bad news is this is a lifelong disease. The good news is it’s relatively inexpensive to treat and only involves giving him a pill once or twice a day. One of the girls who works here has a pup on thyroid medication and she said it costs about $30 a month to treat him. The reason I’m calling our Boden a superstar is, well, because he kind of became one last week. The students of Shippensburg University’s Animal Alliance had a booth on campus to raise awareness about adoption and CVAS and they wanted to bring a dog along. There are some really amazing people in that group and they’ve done a lot for us and our babies, so of course we said yes. Boden set out in the end of March to hang out at a college campus for a while. Oh, the photos they sent. This guy was loving it. He got so much attention and you could tell by the expression on his face that he just ate it up. The college kids said he loved belly rubs and would go up to anyone for attention. They couldn’t say enough good things about him. Boden has one of those faces you just want to smush. We haven’t had a lot of interest in him, sadly. I think it’s because people are worried about the hypothyroidism. Because we’re an open-admission animal shelter, we get a lot of stray animals. When they come to us as strays, we don’t have much, if any, information about their past or their health. Sometimes we have animals that show signs of illness once they’ve been with us for a while and other times, it’s not until he or she is in a home for a while that something might pop up. Other times, we adopt out animals who live 18 healthy years. It’s always tough to tell. I will never forget the older dog who showed up in our outside run overnight with a huge cancerous mass on his thigh. There was no information about him at all, but it was clear to see whoever had him didn’t want to deal with the illness. I don’t understand how you can live with a pet and love a pet, but not make that final journey with him or her. I know it’s difficult. Believe me, I could tell you stories about my animals or my mom and dad’s animals or my sister’s animals that still rip me up to this day. But I’ve always thought it’s important for a pup or a cat to have someone familiar there when they say their final goodbye. None of us like saying goodbye. It’s one of the most difficult aspects of pet ownership. But remembering the joy the animal added to your life can go a long way to soothe the hurt. I know that Boden will bring a tremendous amount of joy to the lucky person who gets to take him home. Could you accept that he comes with some issues and take a chance on adopting this superstar? It might be the best decision you’ll ever make. Jennifer Vanderau is the Director of Communications for the Cumberland Valley Animal Shelter and can be reached at: cvascomm@cvas-pets.org, or by calling: (717) 263-5791. The shelter accepts both monetary and pet supply donations, and operates a thrift store in Chambersburg. Help support the animals at CVAS by donating to or shopping at the store.